The church was built in 1838, with the foundation stone being laid on 28 May. The church was built as a result of a number of generous gifts, including a £2,000 legacy from Miss Hyndman. Professor William Smyth gave the land for the church and for 2 church schools which were built later, but have since been demolished. The church was built using local stone from the Kerridge quarries and it is now a Grade 2 listed building. The consecration of the church took place on 11 October 1839. The first vicar was Rev William Courthope and there is an elaborate stone wall plaque in the church as a memorial to him. The original church design included a three decker pulpit, a gallery at the west end for the choir, two aisles and box pews. It originally seated 536 people, a third of which were free seats for the poor and the remainder were rented for 10 shillings(50p) a year. Rents for pews ended in 1890. In 1868, only 30 yrs after being built, the church was closed for major alterations. The pews were rearranged, pulpit moved and a screen was built under the gallery. Then in 1876 the clock for the tower was donated by Charles Brocklehurst. In 1879 the church became a separate parish, having originally been part of the parish of Prestbury. 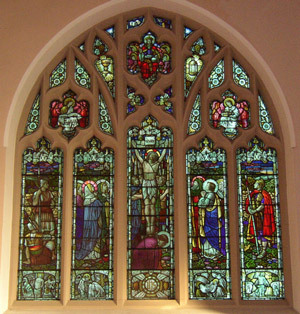 One of the churches finest features is the East window which was installed in 1912. The vestry was also built in the same year. Further changes were made in 1939 to celebrate the church’s centenary. When Trinity School closed in 1976 more alterations were needed at the church. The school had been used for meetings and Sunday School, so there was now a need to create some meeting rooms in the church building. A wall was built at the rear of the church to create the upstairs rooms, now called the Delamere and Roewood Rooms and the present day Brocklehurst Lounge, kitchen & toilets. In 1992 the box pews and choir pews were replaced with chairs, a new raised dais was installed in front of the existing communion rail and a rail fitted around the dais to make additional places to serve communion. The pulpit was replaced with a lightweight portable lectern, made partly from some of the original oak screens. These changes meant that we can now use the main worship area for events throughout the week: the chairs can be moved or even removed depending on the occasion. In 2012 we moved the church kitchen to its new position and created a quiet room called Nicholson Nook. We increased the number of toilets, one of which has disabled access and baby change facilities. In 2015 we redecorated the the Delamere and Roewood Rooms to be more up to date and appealing to our young people, who helped with the ideas and the decoration work. The church uses screens to show prayers, pictures, song words, video clips and announcements in the service. There is also an amplification system and a loop system for the hard of hearing. As the congregation has grown, we have built a small team who work in the church office beside the front door of the church. Our vicar, youth minister, children and families minister and administrators can often be found there during the week. Since 1839 there have been 21 vicars with two of them staying for over 20 years – Rev W Laycock, 1877 – 1906 and Rev J G Tsipouras, 1982 – 2003.